Who would have thought that a promotional video for Al Gore would appear on a page titled Exciting Links for Boring Days? 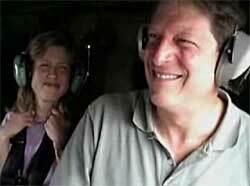 It’s a casual visit with Gore showing a bit of family life, his mother’s home, and a ride in Marine 2 and Air Force 2. His daughters poke fun at his movie watching habits, and interspersed is a little talk of the environment, education, and the American dream. It’s one of the most human renderings of any politian I have seen. Did anyone see this six years ago?